Way before we knew what childhood obesity was, we happily frittered away our pocket money on the most wildly coloured sugar filled sweets that we could possible find at our local corner shop, and at the sadly departed pick ‘n’ mix section of Woolworths. There was nothing quite so fun as enjoying a sugar-induced high which was swiftly followed by tummy ache and a tutting dentist talking about cavities. Some of our favourite childhood sweets are still available if you know where to look for them in some of the most random of shops, not to mention the thriving online trade in these coveted sweet treats. You can read about some of our favourite childhood sweeties right here. So these are still available if not widely – they can crop up in pound shops, pick ‘n’ mixes and garages, but we definitely enjoyed them during their hey-day. These individually wrapped sweets which are undeniably a pain to unwrap with the wrappers getting stuck and making the sweet sticky, are classic British sweets. With the fruity and sweet fruit salad contrasted by the aniseed taste of the black jacks which everybody secretly dislikes bit, these were often a part of a 10p bag of penny sweets. Manufactured by Barrett’s, now under the Candy Land logo, you can also buy tubes of these individually if you are lucky enough, so that you can enjoy uninterrupted pineapple and raspberry chews, or alternatively a pack of black chews for an aniseed flavoured chew. Look out for them in your local shops for a sweet retro taste. Like fruit salad and black jacks, push pops are still available to buy, and you are most likely to come across them in corner shops, post offices and chemists where you can sometimes find the most obscure things. These plastic encased sucky sweet that come in flavours such as blackcurrant, strawberry and cola must be absolutely horrific for your teeth, whilst also managing to cover your hand in gooey sweet saliva that would drip down the plastic tube. Not sure why we loved them so much actually considering how messy they were! 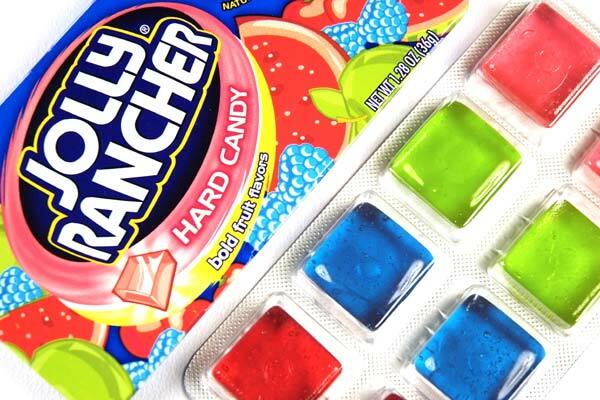 For a brief period in the 1990s, British kids could too enjoy the North American sweet of Jolly Ranchers with their coveted hard sweets with tasty flavours such as the unusual watermelon. Unfortunately this period was short, since due to certain E number s within these sweets, they were later withdrawn from European sales. If you have an American candy style shop near you, chances are that you can probably find a packet or two lurking there, or alternatively you can order them off the internet. Probably one of the worst ideas when it comes to a sweet treat, candy cigarettes were one of those accessory sweets (up there with sweetie bead bracelets) that we loved to parade around with whilst pretending that we were smoking. You can probably still find these lurking about, but perhaps they are sweets that are best not encouraged, although they were delicious!